Since she released her debut album in 1967, Merit has established herself on the Swedish music scene as a highly regarded cult figure, with her very own blend of Nordic folk music and jazz based on organ, groovy drums and wordless singing. Before releasing albums in her own name, Merit went to New York to evolve as a musician, and got to play with Miles Davis, and was given lessons by Joe Zawinul and Lalo Shifrin. Since then, she has collaborated with names like Roine Stolt, Ola Magnell, Kaipa da Capo, Made in Sweden and Beppe Wolgers and has influenced numerous musicians, like Trummor & Orgel, Hans Lundin (Kaipa), Ola Salo, and many more. In 2005 Ola Salo and Martin Axén initiated the release of “Merit – Queen of Swedish Hammond Groove”, a best of album to celebrate her influence. Bootcut – a side project with Beardfish mastermind Rikard Sjöblom – covered her “Gånglåt från Ovanåker” for the ambitious 3CD “Rökstenen: A tribute to Swedish Progressive Rock of the 70’s” a few years later. 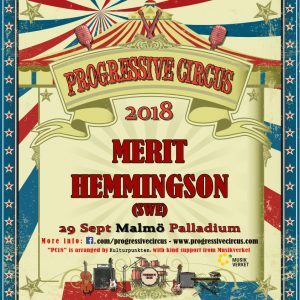 In 2015, Merit played at Sweden Prog Fest, and the following year she released her latest record “Merit”, which is the first with her own material. She also collaborated with a music scientist and Sahara Hotnight’s drummer Josephine Forsman to compose a song that scientifically proved would give the listener energy. Merit has been Grammy nominated several times, has released 20 albums and was introduced into the Swedish Music Hall of Fame in 2017. For PC18, you will get a show with Merit on organ and Ola Hultgren on drums (Veronica Maggio, Ane Brun, etc). Prepare to groove yourself into the deepest Swedish musical woods!